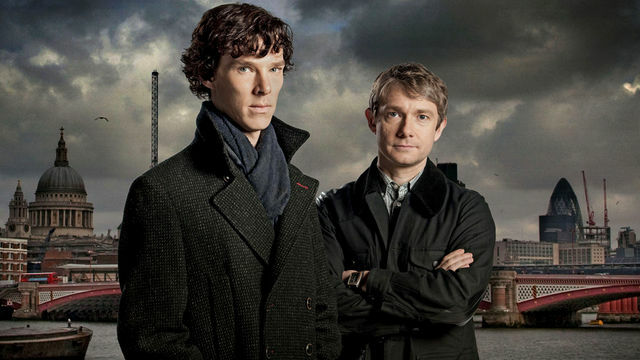 After a two years and six episodes, Benedict Cumberbatch and Martin Freeman won the hearts of millions as Sherlock Holmes and Dr. John Watson in Sherlock. With the series being written by Doctor Who's head writer, Steven Moffat, Moffat essentially has England and many other countries gripping for more. However, after a sort-of-but-not-really cliffhanger ending to the second season, the series went on a hiatus, mainly to the incredibly busy schedules of the two lead actors, hence the opening joke, and Moffat (who has been busy working on the Doctor Who 50th Anniversary). But now, the BBC has offically given word that the upcoming season of Sherlock will premiere on PBS Masterpiece at 10pm on January 19th, followed up by Downton Abbey . Oddly enough, although this is the first date to be announced, it is the US release date. No UK release date has been announced as of yet, but the BBC assures that the UK will in fact be getting it before then. The three upcoming episodes and their basic plots have already been revealed, so if you wish to avoid spoilers, do not continue reading this paragraph. The first episode will be titled "The Empty Hearse" which will delve into Shelock's "death". The second episode will be titled "The Sign of Three" which will feature Watson getting married, and the third episode will be titled "The Last Vow". Season 4 of Sherlock is presumed to be happening in the near future, but at this time, no official word has been made and most likely will not be made until Season 3 has finished up. Until then, be sure to check out both Freeman and Cumberbatch in the upcoming film, The Hobbit: The Desolation of Smaug.